Since January I’ve delivered a seminar called Serving as a Board Member right across Canada, and I’ve heard a lot about the problems boards experience. The striking thing I’ve learned from these stories is that the very worst problems seem to occur in churches. I know there are some very good church boards, but I mostly hear about the dysfunctional ones. Board members have a unique relationships with the church that other ministries don’t have: they are directors and beneficiaries at the same time. By design, board members are drawn from the church’s members (beneficiaries), so there can easily be a conflict between what they personally want from the church and their director’s duty of loyalty to put the interests of the church ahead of their own. A Christian agency such as an inner-city mission or an evangelism ministry does not (usually) have board members who are at the same time users of their services, but churches always do. Not only are they beneficiaries, but because churches have a central place in the life of a believer, directors are personally affected in a significant way by the board’s decisions. What makes this a potentially volatile situation is the directors’ emotional connection to the church coupled with their feeling of expertise in church life. The strong emotional connections arise from the intertwining of their personal lives with church life: they might have been married there, buried a parent from there, or raised their family there. Their feeling of expertise (which could be very legitimate) comes from volunteer experience in church ministries, their personal Bible studies, and the books they read or conferences they attend. Should we all be prayer warriors or should we all be ladling soup? Agency directors might defer to the professional expertise of staff, but church directors are more likely to feel just as knowledgeable as the church staff regarding how ‘church’ should be done. The director/beneficiary combination means that church directors have a feeling of ownership that agency directors don’t have. In theory, a church director may have to vote for something they personally don’t want because it is in the church’s best interest, but in reality many people find that hard to do. The result is that church boards are more likely to be driven by a wide range of personal, subjective opinions than are agency boards. 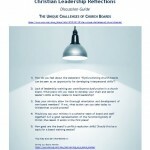 Church board leadership is often the first experience many church members have in leading an organization. Directors may earn their living in a trade, in office work, or in sales. They may be a homemaker or a team supervisor, but if the church’s membership reflects society, few members will have experience governing. They simply don’t know how to be a good board member. It is very easy for a new church director to think, “Finally, it is my chance to make the church the way I want it!” This simply isn’t so. And it certainly isn’t governance. Unfortunately for local churches, they often end up as the training ground for directors and have to endure the consequences. A live presentation of Serving as a Board Member is now available on DVD from the Canadian Council of Christian Charities. It is a very practical and perhaps even blunt seminar in 8 modules of less than 20 minutes each that you can show at board meetings to help everyone become a better board member. No beating around the bush in this DVD! I think that’s why one denominational district office bought 40 copies to give to their smallest churches. I really encourage you to check it out. Church boards have spiritual overtones that agency boards do not have. The pastor is the spiritual leader of the church, and therefore has spiritual responsibility for the members, making it more difficult for directors to either vote against the pastor or to address performance issues with the pastor. It is difficult enough to do this with an executive director, but it is harder still with your own pastor, the person to whom you turn when in need of spiritual support. But when issues are not dealt with openly, someone is likely to resort to politics to build support for the necessary corrections. The pot boils until it explodes. I remember seeing someone open the lid of a pressure cooker without first letting the steam blow off. BANG!!! Broccoli all over the ceiling and severely burned arms. It’s never a pretty sight when people bottle up their concerns, but that’s what some church directors do because they feel constrained by the spiritual overtones. When they feel strongly about something and yet are denied a voice by the pastor or their own reluctance to speak up, BANG; some little thing will finally precipitate a huge crisis. Pastors are likely not equipped to provide leadership to their boards. My doctoral research showed that a significant percentage of agency CEO’s are second-career people who have already gained extensive executive experience in the for-profit world. This equips them to provide the kind of leadership that boards expect of the senior staff person. Pastors are trained in many things: for example, they know how to do pastoral work, to lead people, and to develop a philosophy of ministry. But I don’t think they learn how to work with boards and I suspect they do not know very much about organizational leadership. The fact is, a church is an organization and it is also a registered charity, so pastors need to know how to lead both an organization and a registered charity. All too often, church leadership is seen by pastors simply as program leadership. If this were true, then a pastor is really Program Director. What this leaves is a leadership vacuum at the board level. All boards look to the senior staff person for organizational leadership, but church boards look to the senior pastor and find…, well, too often they find not much in terms of organizational leadership. Since power always fills a vacuum, if the pastor doesn’t provide organizational leadership, some board member will likely step up and provide it, and then a power struggle inevitably ensues between board and staff. The pastor thinks the board has usurped the pastor’s role, but in reality the pastor has left the organizational leadership chair vacant and is sitting instead in the Program Director’s chair. The vacant chair will be particularly noticeable in discussions about strategy, policy and administration; all areas that are outside of programming. The pastor needs to own all of these responsibilities and provide leadership for them, even if some of them are delegated to staff. Board orientation is crucial. All new board members should be educated on what governance is and the role of a director. It is vital that they understand the conflicting roles they have as director, beneficiary and perhaps even program volunteer. Help your directors to be good governors right from the start. CCCC has material to help with this. Board development must be continuous. Every board meeting should have a time to learn about some aspect of governance or board service. Every board should have the goal that they will produce the very best board members possible by the end of their terms. Based on the number of regular board meetings you have per year, and the number of years in a single board term, develop a learning plan for the board that a director will cycle through once per term. Both pastor and board must work hard to ensure that everyone truly sees church leadership as a partnership between staff and board. While you must follow your denominational practices, legislation and trust law require the board to exercise its authority in civil matters. Pastors and directors must never fall into the trap of thinking it’s “us vs. them.” I really like the way Charles Olsen describes the board (his book is listed below): The board of a Christian organization is the people of God in community, the body of Christ, with members having differing gifts, wisdom and functions. The group’s life should be formed by scripture, prayer, silent waiting, witnessing and serving. Their meeting is not a gathering of individual people with business to transact, but is the functioning body of Christ.” Wow! That puts church governance into proper perspective. I’ve taught a 1 hour course at seven seminaries and Bible colleges this year called Welcome to Charity Leadership. I congratulate these schools on taking me up on my offer to come for free to teach this course. (Check my travel schedule to see when I’ll be near you.) It opens students’ eyes to the reasons why their future treasurers or administrators may say they cannot do certain things. I hope this knowledge reduces future conflict. (CCCC also provides this course as a webcast that can be accessed for free by anyone. We encourage faculty teaching Christian Leadership to include it in their curriculum.) Seminaries and colleges should also offer training that expands leadership from people leadership into the realm of organizational leadership covering topics such as strategy and its implementation, organizational and program evaluation, governance, board/staff relations, and change management. Students should learn not only from great Christian writers but also from the best that is offered from the secular world. Kouzes and Posner, John P Kotter and Jim Collins are outstanding authors who have a lot to say that is of value to Christian leaders. A mandatory textbook for every Christian Leadership class should be Reviewing Leadership: A Christian Evaluation of Current Approaches by Robert Banks and Bernice Ledbetter. Does your favourite Christian leadership expert stand up to theological scrutiny? These authors dare to take everyone on! Okay, here is a real “out there” suggestion. An executive pastor in Calgary was the first person who suggested this to me, and I thought it was completely crazy. But a few years later, I’m not so sure. So, for your consideration: maybe the senior pastor should instead be the preaching pastor and perhaps the program director, and the executive pastor should become, ahem, the executive pastor and report to the board instead of the preaching pastor. Are we unfairly asking pastors to be good at something that just isn’t in their gift mix, or interest, or skill base? Maybe we want them to offer their pastoral services to the church and let others provide the organizational leadership services. From what I’ve heard and read, this is pretty much the arrangement that The Meeting House has and it seems to work well for them. Just a thought. I have mixed feelings about the model, although I can see its advantages. Two other books are gems as well. Called to Serve: Creating and Nurturing the Effective Volunteer Board by Max De Pree is a practical guide filled with pearls of wisdom. The last book is one that should help the board with group decision making skills: Practicing Discernment Together by Lon Fendall, Jan Wood and Bruce Bishop. These books are all under $20 and should form the core of a governance library in a local church. And don’t forget the Serving as a Board Member DVD set. You can download as many of the related workbooks as you need for free. Anyone care to wade in on this topic? Excellent article! I read it through twice and loved your comments about the role of a pastor and what some churches should consider changing into. I think too ofter we have put people in positions that do not meet their skills, just because it’s just the way it’s been done for years! Why would we get someone with a teaching gift to also hold a government-heavy role just because their title? It certainly is food for thought. We shouldn’t be setting people up to fail! Quick question on conflict of interest within church boards. A married couple who both sit on the board of church A (one is board president, one is just a sitting board member), who recently took membership classes to become members at church B (where they plan to attend and tithe regularly, so they may send their child to the school at church B for a discounted price), feels like a conflict of interest to other board members, but the married couple does not see it that way. What are your thoughts? A good answer may depend upon which country or jurisdiction you are in, and the details of your church’s constitution or by-laws. If you are a CCCC member, call the office with this question. My quick answer to your quick question is that the couple is most likely ineligible to serve as directors because: a) the don’t attend anymore, b) they don’t support the church financially anymore, and c) they have actually joined (or will be joining) a different church. If the constitution or by-laws are silent on the issue, they still shouldn’t be directors because they have no interest in the church while they are attending elsewhere. May you act with wisdom and insight. Ray, this is a landlord-tenant issue that normally would be a matter of discussion between representatives of the two churches, rather than a meeting of the two boards. Not being privy to the nuances of all the issues, I agree that your board needs to be thoughtful in its relationship with the church. In the end, your board is free to decide where the church will meet. Be sure to pay attention to the details of your lease agreement. Can someone serve on a church board who has declared bankruptcy personally? You’d have to check your bylaws for anything specific to your church, but the general answer is that an undischarged bankrupt person cannot be a director of a charity. Blessings! I Pastor a church of around 100. Because we minister largely to those who have had rough earlier lives and really have no, or limited, qualities for a church Board I’m limited in who I can recruit. I have asked several that I felt qualified and was turned down. I am considering asking the son of a current Board member to come onto the Board. I have known him since he was an adolescent and he is a 28 year old solid man of God. What are your thoughts on this. I see that your church is in the U.S. and I’m not up on American law. In Canada, there are limits to how many “non-arm’s length” relationships you can have on a charity board. I’ll give a Canadian answer below, but first, you mention his age. If you think he might be too young, the only concern is that he be a mature Christian, which you think he is. So no concern there. I think you have a wonderful church that is obviously doing it’s work quite well, judging by the people you have attracted! Board of 5: one married couple and three others not related to the couple or anyone else on the board. Board of 9: two married couples and five others not related to the couples or anyone else on the board. Board of 5: one married couple, one person related to the couple and only two others not related to the couple or anyone else on the board. Board of 9: three married couples and three others not related to the couples or anyone else on the board. This is still offside even if none of the three couples have any relation to another of the couples or anyone else on the board (i.e. there are 6 people, in total, who have a non-arm’s length relation to someone else on the board). Thanks for the great work you are doing for Christ! Thank you very much for taking the time to answer my question. I really appreciate the swiftness of you response. May God continue to Bless and Keep you!